Research has been collected from the United States Environmental Protection Agency in regards to global warming and climate change, the causes, how it affects us - socially, economically, environmentally - and how it can be prevented further. Climate change refers to any significant change in the measures of climate lasting for an extended period of time. In other words, climate change includes major changes in temperature, precipitation, or wind patterns, among other effects, that occur over several decades or longer." Our Earth is warming. Earth's average temperature has risen by 1.4°F over the past century, and is projected to rise another 2 to 11.5°F over the next hundred years. Small changes in the average temperature of the planet can translate to large and potentially dangerous shifts in climate and weather. The evidence is clear. Rising global temperatures have been accompanied by changes in weather and climate. Many places have seen changes in rainfall, resulting in more floods, droughts, or intense rain, as well as more frequent and severe heat waves. The planet's oceans and glaciers have also experienced some big changes - oceans are warming and becoming more acidic, ice caps are melting, and sea levels are rising. As these and other changes become more pronounced in the coming decades, they will likely present challenges to our society and our environment. You can take action. You can take steps at home, on the road, and in your office to reduce greenhouse gas emissions and the risks associated with climate change. Many of these steps can save you money; some, such as walking or biking to work can even improve your health! You can also get involved on a local or state level to support energy efficiency, clean energy programs, or other climate programs. Driving a car, using electricity to light and heat your home, and throwing away garbage all lead to greenhouse gas emissions. You can reduce emissions through simple actions like changing a light bulb, powering down electronics, using less water, and recycling. This site provides more than 25 easy steps you can take at Home, School, the Office, and On the Road to protect the climate, reduce air pollution, and save money. Take action today! Small steps add up, if we all do our part. Replace your five most frequently used light fixtures or the lightbulbs in them withENERGY STAR® qualified products and you will help the environment while saving $70 a year on energy bills. ENERGY STAR lighting provides bright, warm light; generates 75% less heat; uses about 75% less energy than standard lighting; and lasts from 10 to 50 times longer. When buying new products for your home, look for EPA's ENERGY STAR label to help you make the most energy-efficient decision. You can find the ENERGY STARlabel on more than 60 kinds of products, including appliances, lighting, heating and cooling equipment, electronics, and office equipment. Over their lifetime, products in your home that have earned the ENERGY STAR label can reduce greenhouse gas emissions by about 130,000 pounds and save you $11,000 on energy bills. Heating and cooling accounts for almost half your energy bill--about $1,000 a year! There is a lot you can do to drive down this cost. Simple steps like changing air filters regularly, properly using a programmable thermostat, and having your heating and cooling equipment maintained annually by a licensed contractor can save energy and increase comfort, while helping to protect the environment. Depending on where you live, you can cut your annual energy bill by more than $200 by replacing your old heating and cooling equipment with ENERGY STAR-qualified equipment. Reduce air leaks and stop drafts by using caulk, weather stripping, and insulation to seal your home's envelope and add more insulation to your attic to block out heat and cold. A knowledgeable homeowner or skilled contractor can save up to 20% on heating and cooling costs and significantly enhance home comfort with comprehensive sealing and insulating measures. Reducing, reusing, and recycling in your home helps conserve energy and reduces pollution and greenhouse gas emissions from resource extraction, manufacturing, and disposal. If there is a recycling program in your community, recycle your newspapers, beverage containers, paper, and other goods. Also, composting your food and yard waste reduces the amount of garbage that you send to landfills and reduces greenhouse gas emissions. Visit EPA's Individual WAste Reduction Model (iWARM) to learn about the energy benefits of recycling, rather than landfilling, common waste products. It takes lots of energy to pump, treat, and heat water, so saving water reduces greenhouse gas emissions. Saving water around the home is simple. Three percent of the nation's energy is used to pump and treat water so conserving water conserves energy that reduces greenhouse gas pollution. Reduce the amount of waste you generate and the water you consume whenever possible. Pursue simple water-saving actions such as not letting the water run while shaving or brushing teeth and save money while conserving water by using products with the WaterSense label. Did you know aleaky toilet can waste 200 gallons of water per day? Repair all toilet and faucet leaks right away. Running your dishwasher only with a full load can save 100 pounds of carbon dioxide and $40 per year. Be smart when irrigating your lawn or landscape. Only water when needed, and do it during the coolest part of the day; early morning is best. See EPA's WaterSense site for more water saving tips. Composting your food and yard waste reduces the amount of garbage that you send to landfills and reduces greenhouse gas emissions. EPA's GreenScapes program provides tips on how to improve your lawn or garden while also helping the environment. Power your home by purchasing green power. Green power is environmentally friendly electricity that is generated from renewable energy sources such as wind and the sun. There are two ways to use green power: You can buy green power, or you can modify your house to generate your own green power. Buying green power is easy. It offers a number of environmental and economic benefits over conventional electricity, including lower greenhouse gas emissions, and it helps increase clean energy supply. There are a number of steps you can take to create a greener home , including installing solar panels and researching incentives for renewable energy in your state . Use EPA's Household Greenhouse Gas Emissions Calculator to estimate your household greenhouse gas emissions resulting from energy use, transportation, and waste disposal. This tool helps you understand where your emissions come from and identify ways to reduce them. Tell family and friends that energy efficiency is good for their homes and good for the environment because it lowers greenhouse gas emissions and air pollution. Tell five people and together we can help our homes help us all. Business and home offices use a significant amount of electricity for heating and cooling, lighting, and operating equipment. Here are a number of easy ways to protect the environment, fight climate change, and help make the air cleaner. Did you know that the total electricity consumed by idle electronics equals the annual output of 12 power plants? Save energy and reduce greenhouse gas emissions at work by setting your computer, monitor and other office equipment to power down when not in use. Activate the power management features on your computer and monitor, unplug laptop power cords when not in use and turn off equipment and lights at the end of the day. Plugging everything into a power strip makes it easy to shut everything down at one time. Office products that have earned the ENERGY STAR feature special energy-efficient designs, which enable them to use less energy while performing regular tasks. Look for ENERGY STAR-qualified office equipment, such as computers, copiers, and printers, in addition to more than 60 product categories, including lighting, heating and cooling equipment, and commercial appliances. Buildings can earn EPA's ENERGY STAR too! ENERGY STAR-labeled buildings provide safe, healthy, and productive environments that use about 35% less energy than average buildings. Their efficient use of energy also reduces the total operational cost of the building. Let your facility's maintenance department know about the ENERGY STAR buildings program, so they can learn how to improve your building's performance. Switching to public transportation, carpooling, biking, or telecommuting, can save energy and reduce greenhouse gas emissions on your way to and from work. Encourage your employer to offer commuter benefits that address limited or expensive parking, reduce traffic congestion, improve employee recruiting and retention and minimize the environmental impacts associated with drive-alone commuting. If you do drive, find out the fuel efficiency of your vehicle at the Federal Fuel Economy website, and make more environmentally informed choices when purchasing your next vehicle by using EPA's Green Vehicle Guide. Reducing, reusing, and recycling at the office helps conserve energy, and reduces pollution and greenhouse gas emissions. Reduce, reuse, and recycle at the office by using two-sided printing and copying; only printing what you need; buying supplies made with recycled content; and recycling paper products, batteries, and used printer cartridges. All of these actions help conserve energy and reduce carbon pollution. For old electronics (e.g., computers, monitors, cell phones, TVs), investigate leasing programs, manufacturer and retailer take-back programs, and municipal programs and events to ensure reuse and recycling. You can also donate used equipment to schools or other organizations and take advantage of any available tax incentives for computer donations. Visit EPA's WasteWise website for information on starting a recycling program at work. Emissions from electricity generated from fossil fuels can be one of the most significant environmental impacts associated with your organization's operations. Green power is electricity that is generated from renewable energy sources such as wind, sun, geothermal, and biomass. Purchasing green power is an easy, effective way for your organization to reduce its carbon footprint and environmental impact. Visit EPA's Green Power Partnership for information on how to purchase green power. Developing a greenhouse gas inventory is a critical first step toward measuring and managing your organization’s climate change impact. An inventory is a list of emission sources and the associated emissions quantified using standardized methods. Many organizations are taking this step and by doing so find that most of their emissions come from building heating and cooling, fleet vehicles, electricity use, and employee travel. EPA’s Center for Corporate Climate Leadership is a resource center to help all organizations identify and achieve cost-effective GHG emission reductions. Explore A Student's Guide to Global Climate Change to learn more about the science and impacts of climate change. The site also provides videos, animations, and interactive expeditions where students can explore and learn how climate change will affect places around the world. The site helps students, their parents, and their teachers learn about solutions and the actions they can take to reduce greenhouse emissions. High school students can investigate the link between everyday actions at their high school, greenhouse gas emissions, and climate change. UsingEPA's Climate Change Emission Calculator Kit (Climate CHECK) (WinZip of Excel spreadsheet, 3.4MB), students can learn about climate change, estimate their school's greenhouse gas emissions, and identify ways to mitigate their school's climate impact. Students gain detailed understandings of climate-change drivers, impacts, and science; produce an emission inventory and action plan; and can even submit the results of their emission inventory to their school district. They can also use Portfolio Manager to compare the energy use of your school with other schools nationwide, and earn the ENERGY STAR for your school if it qualifies as a top performer. Give a presentation to your family, school, or community group that explains how their actions can cause or reduce climate change. You can use EPA's “Create a New Climate for Action” presentation (PowerPoint file, 51 pp, 32MB) or full–screen PDF (51 pp, 33MB); presenter notes (PDF) (51 pp, 5MB) or develop your own. Get creative, and think of more ways to help others make a difference! College students can play an important role in reducing greenhouse emissions at their colleges or universities by reducing their emissions from energy they use in dorm rooms. Students can also work with school administrators to develop an inventory , increase energy efficiency on campus, and reduce their school's greenhouse gas emissions by using green power. 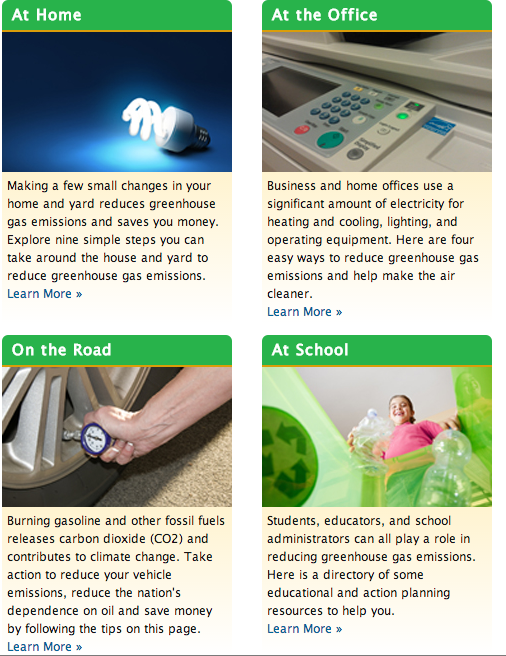 Use the teacher resources on EPA's Students Guide to Climate Change. Use the Climate Change, Wildlife and Wildlands: A Toolkit for Formal and Informal Educators to learn about the science of climate change and its potential effects on our nation's wildlife and their habitats. Download and share EPA's eight-page brochure, Frequently Asked Questions About Global Warming and Climate Change: Back to Basics (PDF) (8 pp, 1.6MB, About PDF), which provides illustrated answers to frequent questions. Enhance critical-thinking skills by introducing the Global Warming Wheel Card Classroom Activity Kit to middle school students. A hand-held wheel card and other resources help students estimate household greenhouse gas emissions in order to encourage students to think about ways they can reduce their personal, family, school, and community contributions to climate change. If you are an informal educator, simply use the Global Warming Wheel Card as a part of your field activities. Investigate what other schools and organizations are doing to educate their audiences on climate change by clicking on Educators' Links, a database offering links to resources such as lesson plans, videos, books and toolkits. The least efficient schools use three times more energy than the best energy performers. By partnering with the highly successful ENERGY STAR for K-12 School Districts and using Portfolio Manager to track and rate the energy performance of your portfolio of school buildings, school districts can serve as environmental leaders in their community, become energy efficient, reduce greenhouse gas emissions, and save money! If you're considering a new building, EPA's voluntary School Siting Guidelines can provide tips for reducing climate and health impacts. School administrators can also work to reduce their school's greenhouse gas emissions by developing aninventory of their school's emissions or by taking the College & University Green Power Challenge. Recycle school or classroom paper, newspapers, beverage containers, electronic equipment and batteries.Reducing, reusing, and recycling at school and in the classroom helps conserve energy, and reduce pollution and greenhouse gases from resource extraction, manufacturing, and disposal. You can reduce, reuse, and recycle at school or in the classroom by using two-sided printing and copying, buying supplies made with recycled content, and recycling used printer cartridges. For your old electronics, donate used equipment to other organizations, or investigate leasing programs to ensure that used equipment is reused and recycled. Driving your vehicle releases greenhouse gases into the atmosphere and contributes to climate change— but you can take simple, easy steps to cut your emissions, reduce our nation's dependence on oil, and save money. When shopping for a new or used vehicle (or even renting a vehicle), choose the cleanest, most fuel-efficient vehicle that meets your needs. With a wide range of clean, fuel-efficient vehicles available today, it’s easier than ever to go green—for the environment, and for your wallet. Check out www.fueleconomy.gov, to find the best, most comprehensive information on vehicle emissions and fuel economy. You can also learn more about the fuel economy and environment label that you’ll see on all new vehicles. The label has been redesigned and updated for even easier comparison shopping. These new window stickers provide fuel economy and environmental ratings for all new vehicles, including advanced technology vehicles like electric cars and plug-in hybrids. And while at the showroom, you can scan the QR Code® on each vehicle’s label to be connected to additional information online, including personalized cost and energy-use estimates. To improve your fuel economy and reduce greenhouse gas emissions, go easy on the brakes and gas pedal, avoid hard accelerations, reduce your time spent idling (no more than 30 seconds), and unload unnecessary items in your trunk to reduce weight. If you have a removable roof rack and you are not using it, take it off to improve your fuel economy. Use cruise control if you have it, and for vehicles with selectable four-wheel drive, consider operating in two-wheel drive mode when road conditions make it safe to do so. For more information, take a look at these tips for driving more efficiently. Get regular tune-ups, follow the manufacturer’s maintenance schedule (which can be found in your owner’s manual), and use the recommended grade of motor oil. A well-maintained car is more fuel-efficient, produces fewer greenhouse gas emissions, is more reliable, and is safer! For more details, including potential fuel savings, check out these tips for keeping your car in shape. 4. ... and don’t forget your tires! Check your tire pressure regularly. Under-inflation increases tire wear, reduces your fuel economy, and leads to higher greenhouse gas and other air pollutant emissions. If you don’t know the correct tire pressure for your vehicle, you can find it listed on the door to your vehicle’s glove compartment, or on the driver's-side door pillar. And when it’s time for new tires, consider purchasing tires with “low rolling resistance,” an energy-saving feature. Use public transportation, carpool , or walk or bike whenever possible to avoid using your car. Leaving your car at home just two days a week can reduce your greenhouse gas emissions by an average of two tons per year. Also consider telecommuting (working from home via phone or the Internet), which can reduce the stress of commuting, reduce harmful emissions, and save you money. And when driving, try combining your errands and activities into one trip. Give E85 and biodiesel a try. Both are renewable fuels (made from renewable sources such as corn) that can reduce greenhouse gas emissions from your vehicle. E85 is a fuel blend containing 85% ethanol and 15% gasoline that can be used in certain vehicles called Flex Fuel Vehicles (FFVs). FFVs are designed to be fueled with either E85 or traditional gasoline. There are millions of FFVs on the road today—to find out if you own one, check the inside of your car's fuel door for an identification sticker, or consult your owner’s manual. If you own a diesel vehicle, consider filling up with a biodiesel blend such as B5, which is a diesel fuel blend containing 5% biodiesel. The Department of Energy’s Alternative Fueling Station Locator can help you locate both E85 and biodiesel fuel stations in your area.